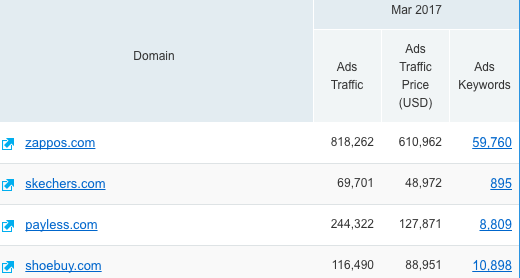 The Ad History report (located under Keyword Analytics in the main menu) is a keyword research report that shows you all of the domains that bid on the queried keyword and had a PPC ad in any of Google's top 8 paid positions over the past twelve months. SEMrush Ad History Report is perfect for allowing you to view past ads in order to analyze the performance of a specific keyword in paid search. After querying a keyword in the search bar of this report, you'll see a table of all of the advertisers that had their ads in Google's top 8 positions for this keyword's results page over the past 12 months. The number in the blue box (green when highlighted) next to a corresponding month represents the position of the domain's advertisement. To be sure, you can always cross reference this report with the other Ad History report (in Advertising Research) and the Advertising Positions report. For example, click this link to see the ad history of the keyword "basketball hoop." Notice Amazon.com's position 2 in the month of May 2018. 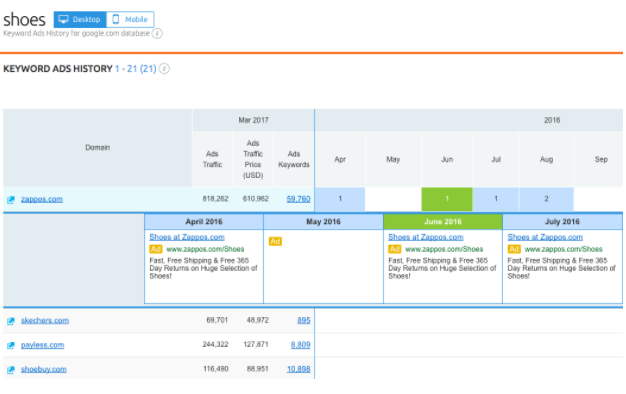 Now, cross-reference that data with Amazon.com's Ad History report and Positions Report with filters for "basketball hoop." You can see that in May 2018, Amazon.com ranked an ad in position 2 for "basketball hoop" in all 3 of these reports. Knowing if a keyword was previously successful in ranking can prevent you from wasting your time searching for keywords and instead of putting that focus on other tasks such as perfecting the actual ad copy. Not only that, but you can also see the amount of ad traffic, ad traffic price and the total number of ads for that keyword. Getting insight into how your competitors are performing is key in gaining the edge for ad placement. SEMrush allows you to see exactly how your competitors are performing for certain keywords and how they ranked monthly for that keyword. For each month, you will also see the last seen ad triggered by a particular keyword and its position in SERPs. See how long a keyword has been used. If a competitor has been using it for more than a couple of months, it has most likely earned them a lot of business. 2. it was used because it was relevant to a season, holiday, or special event. By researching PPC keywords, you will be able to discover new keyword ideas and conversion opportunities. By clicking on a particular domain, you will launch the Domain Ad History report, which you can use to conduct competitive PPC analysis. Identifying trends within Google is always an important step in optimizing your campaigns and this remains no different for advertising. Understanding how certain keywords rank during certain times of the year can allow you to plan out your campaigns ahead of time, knowing when certain keywords are giving you the highest ROI. Let’s say you are a local store specializing in christmas decorations, you can enter the keyword ornament in to the Ad History report you can what months it is ranking the highest (i.e. the holiday months).